In the early spring, asparagus grows wild in the ditches and pastures surrounding the vineyards. When the time is right our family makes a yearly foraging excursion to collect asparagus from the surrounding area. Several pounds of asparagus are collected, washed and chopped. Then winemaker Brent works his kitchen magic with this delicious dish, often with several pans sizzling at the same time. Somehow, we never have leftovers. 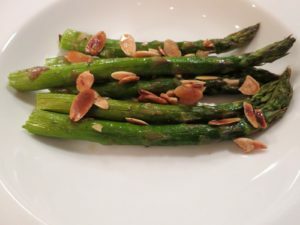 Chop asparagus into bite-size pieces. Coat a large, lidded frying pan with olive oil/cooking spray and sauté asparagus for 3 minutes or until crisp/tender. Add lemon juice, and salt. Cover and let cook 6 minutes, or until asparagus is bright green and softened. Add almonds to asparagus mixture. Salt and pepper to taste, and serve warm with Stone Cottage Cellars Chardonnay.